Tested: How hard is 3D printing? One emerging technology that you're likely to hear a lot from in the future is 3D printing. You basically download a 3D model from the Internet, load it in the printer and wait until your model rolls out. But is it really that easy? 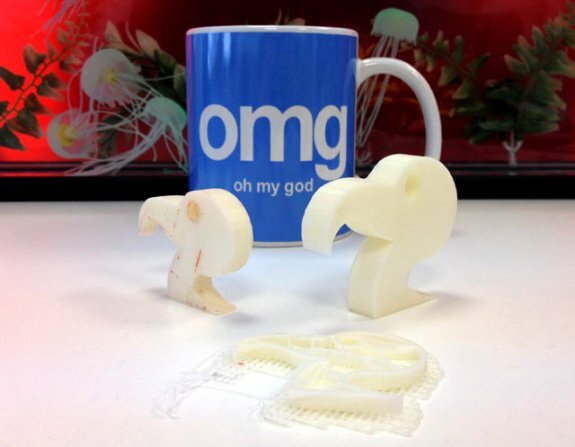 British tech site The Register tested how hard it is to recreate the website's iconic vulture logo with a Makerbot Replicator, a $1,999 3D printer. The reporter loaded up SketchUp, which was recently sold by Google to Trimble, and imported the website's vulture logo to transform it into a 3D model. The next step is to convert the model to the .STL format using a Sketchup plug-in, and exporting it to the Makerbot's ReplicatorG software, which in turn produces the GCode script the model is built from. When the script is generated you can alter a number of parameters, including the object's infill. This setting lets the software construct braces within the model to give it strength, the more infill the stronger the model but the longer it will take to print and the more material it will consume. Printing takes quite some time so the reporter recommends saving the script to an SD card and plugging it straight into the Makerbot to avoid risking a crash or reboot. Before you start 3D printing, the platform has to be covered with a Kapton film and you need to ensure that there's a little grip. This is not a set-and-forget process because the Makerbot chugs around and gets hot and cold while creating your 3D model. The first stage of the printing process is laying down a raft, it's basically a mesh which grips the Kapton film to provide some plastic for the model to be built upon. This is mainly for models without a flatish bottom, but the reporter decided to apply it just to be safe. The software calculates the shape of the raft and the machine's extruder head traces around the outline and fills in the shape, printing the ABS plastic model layer by layer. Unfortunately, the first attempt to failed as because the model stuck to the platform. There's a whole section in the Makerbot FAQ dedicated to this problem, so the reporter implemented the advice but even the second attempt didn't turn out perfect because the raft started to heat an curl, eventually losing grip on the platform and sliding around. The third try was a success, presumably because everything was up to a good operating temperature. The FAQ advises to raise the platform temperature from 100° to 115° to reduce the change of the raft curling, and with this change the reporter can now reliably produce a colony of vulture heads. The combined cost of the plastic used in creating two vulture heads plus the two failures totaled 12 pence (or about US$0.2) plus the electricity cost. The technology is still in its childhood, but offers a lot of promise in a not-too-distant future.